Fever Blister, better known as cold sore or oral herpes is a skin condition that is typical herpes simplex virus infection. The virus lies quiescent inside the body and is reactivated if the immune system falls from its normal rhythm. It may start as a blister and snaps out clear fluid. It will cause pain, burning sensation on the affected part then forms a scab. The usual parts that are mainly involved are the lips, nose and tongue. This happens because the virus goes to areas that the immune system may not detect their presence, making them latent in the mean time. This stage is also called as prodrome. There will be swelling, redness and inflammation on the site the blister will form. This stage is characterized by the tingling sensation on the future site. The usual duration of this stage can vary from 1-2 days. At this stage, a blister is formed filled with clear fluid or these blisters may appear in cluster and they can vary in size. This stage lasts up to 2 days. This is considered as the stage where the infection is most contagious. The blister ruptures and leaves a reddish sore that eventually turns gray. The clear fluid that broke out contains millions of viral cells that can be transmitted directly but this stage only lasts for a day. This is also known as the ulcer stage. During this stage, the affected area scabs one after the other. Initially, it will scab first time and may bleed. This may also cause itching or burning sensation. Another scab is formed but smaller than the first, it will again peel off and another scab is produced. Until the scab disappears; it will not leave a scar. This stage lasts 2-3 days. 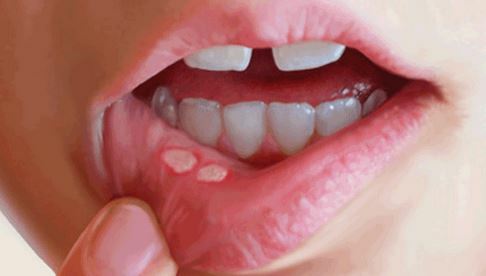 Fever blisters or cold sores are mainly caused by herpes simplex type 1. Although this virus came from the same family of virus that causes genital herpes; herpes simplex type 2, fever blisters are not considered as a notorious ailment. The virus hides in the nerve cell, thus makes immune system unaware of its existence. Opportunistic virus stays dormant and will be activated when the virus sense that the immune system is down or the body is busy fighting off other illness and will not be able to release antibodies for it to be killed. The effect of the infection varies from person to person, an individual can have reinfection and the others may not. Studies have shown that a major contributing factor of acquiring this disease is stress; which also has a lot of factors that could cause it. An individual is well aware of the situations they are stressed so it is advisable for them to be conscious with their body, and notice any tingling or burning sensation anywhere so as to get immediate care. Fever blisters resolve by themselves in a week or so, but if the condition affects your life greatly there is a way to relieve it in a shorter span of time. The best time to treat fever blisters is during the prodromal stage when the affected site has the tingling or burning sensation. This will not cure for there is still no known cure for this, but early treatment can shorten the course of the disease. There are many known medications that will manage this condition, some are given topically and others taken orally. Several antiviral medications are recommended for specific a specific type of infection. This is recommended for recurrent infections. Immediate intake of this medication an hour after the outbreak will help reduce the time of healing into 2 days, it will also reduce the likelihood o symptoms to appear. The effectiveness of this drug depends on the onset of administration, the sooner Denavir is taken, the better. This is also used for the same reason as Denavir. Studies have shown that applying this frequently reduces time of healing up to half a day. Giving low dose of Zovirax will help reduce the symptoms, but if pain is present it is advisable to give higher dose to manage pain. Both are recommended for recurrent cold sores. IT is said that these drugs will decrease the healing process up to 2 days. Although taking medication is an effective way of treating fever blisters, studies have shown that for individuals who had recurrent type of infection, a daily dose of Zovirax, Famciclovir and Valacyclovir should be given to reduce symptoms as well as lessen the duration of the disease. This is used to relieve pain and help reduce symptoms by softening the blisters and allay dryness. This medication is applied topically and is indicated for pain. It also contains moisturizing skin shield and an herbal complex. It is linked that moisturizer aid in a speedy healing of the blisters and will assist in relieving pain and burning sensation. There is no definite way to avoid fever blisters, chances cannot be calculated to predict when this will occur but there are certain measures that will help prevent not just cold sores but other diseases as well. Avoid the things that can cause stress; it is up to the individual to determine what these stressors are and be able to avoid them. Although herpes simplex virus type affects the mouth, nose and tongue it can also reach other parts of the body. If the fingers are infected; this is called as herpetic whitlow. In worst cases, the infection can reach up to the brain and may lead to brain damage, dementia and cognitive abnormalities.